Happy April! Meatless March is over but, psych! Here’s another vegetarian recipe. I actually did not struggle too badly with the no meat thing until the last week, at which point I suddenly had the giantest of cravings for a Canyon Creek burger from Ted’s Montana grill. I still have not satiated this craving, but it’ll just be all the better when I do. 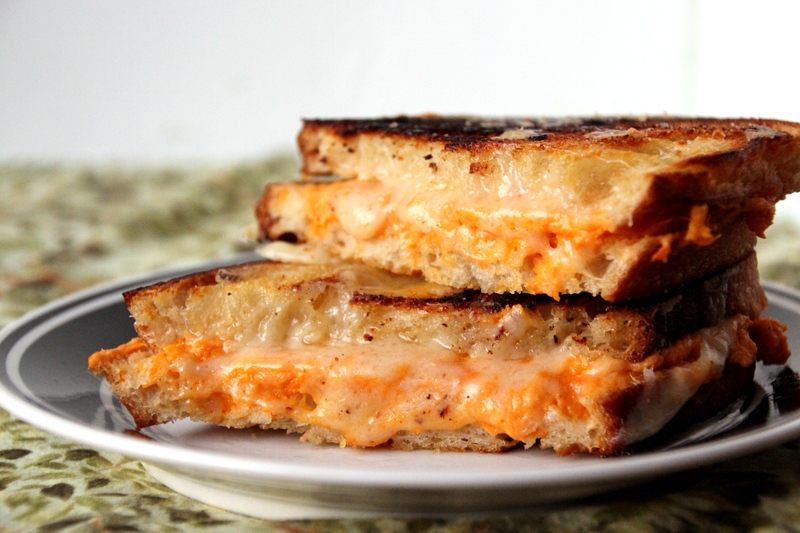 Regardless, in case you are not aware, April is National Grilled Cheese Month! Yep, that’s a thing. ‘Merica. I happen to super love grilled cheese and as such will be employing the theme this month; check for a new flavor every week. Hope you enjoy the series! First off I went with one of my favorite things, sweet potato. You may have noticed I have a slight obsession so if it’s not your thing just close this tab and come back next week. If it is your thing, however, trust me when I say this is a grand adventure for your mouth. Several weeks ago a friend was making dinner and ran out of the main course (in her defense, I arrived quite late) and offered to make me a grilled cheese. On a whim she threw some cooked sweet potato in with it and on that day began a new era. In my version I upped the flavor complexity a bit by mashing my sweet potato with goat cheese and a little chipotle, and then layered it with sliced Gruyère. I opted for sourdough bread from a local bakery but I think a seeded multigrain would also be excellent, as well as a fluffy potato bread. Whatever you decide to envelope your cheese delight with, I’m sure you’ll be thrilled with the outcome. Creamy sweet potato with the slight tang of goat cheese pairs beautifully with Gruyère, and the chipotle adds a nice little kick. I made mine pretty mild (shocking, I know) but you can definitely play with the ratios to suit your fancy. 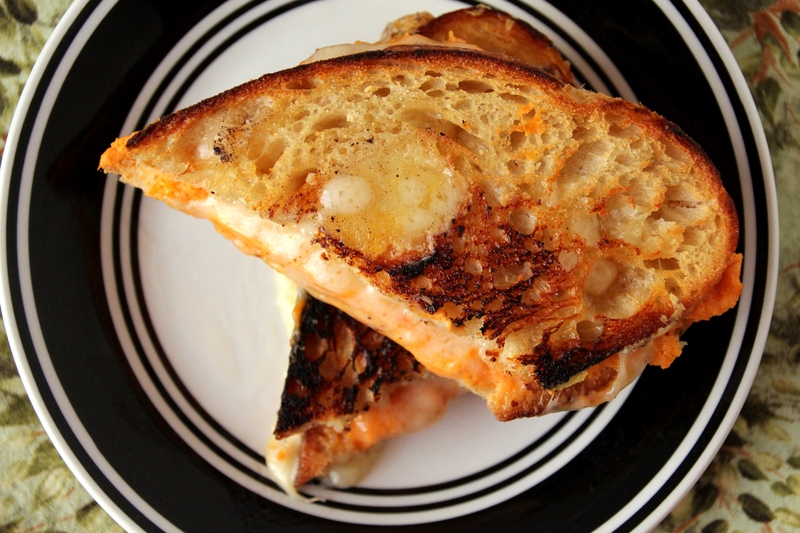 Step up your grilled cheese game and make yourself a Real Adult Dinner™ this evening. But if you want to pair it with chocolate milk, I won’t judge. Meanwhile, mash together sweet potato, goat cheese, and chipotle; add more spice if necessary. 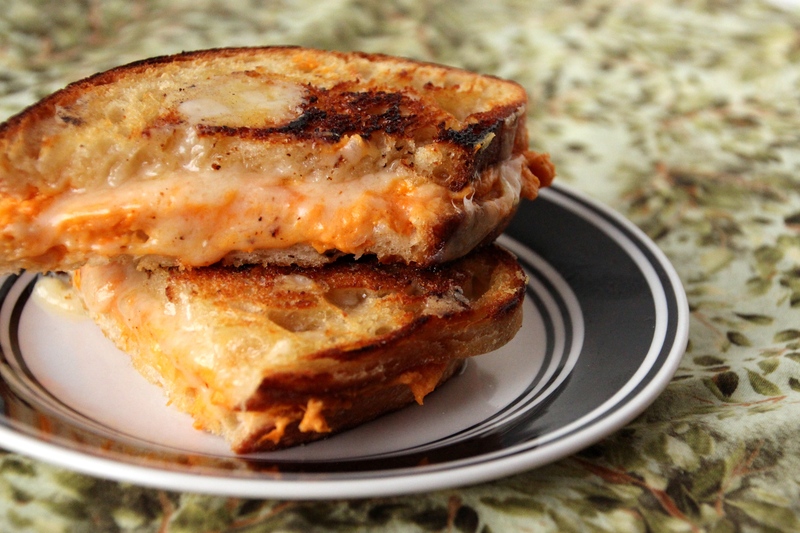 Spread sweet potato mixture on one slice of bread, and arrange Gruyère in a single layer on the other. Gently transfer one side on top of the other, and cook an additional 30-60 seconds so the flavors meld. It’s a new favorite of mine! Hope you give it a try!